Princess Merida: If you had a chance to change your fate, would you? 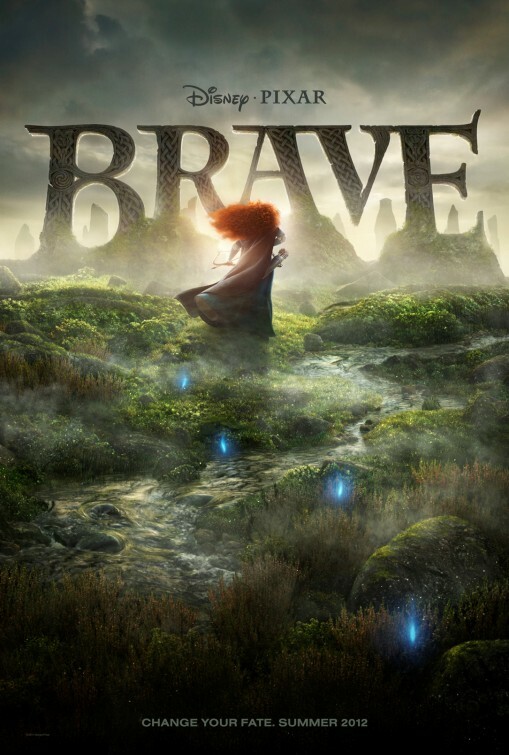 Not surprisingly in the least, Pixar’s 13th animated feature, BRAVE, is breathtaking from the very beginning. The sprawling Scottish highlands are already beautiful in their natural state but when Pixar uses their imagination and technical ability to recreate something, that place is reborn anew on screen. 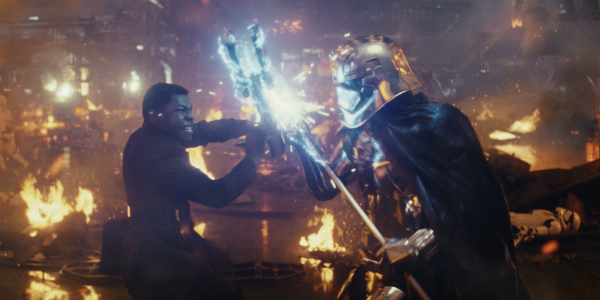 Ordinarily, they have the same ability to reinvigorate even the oldest of stories and this time around, they take aim at the very familiar princess archetype and while they do make BRAVE into an altogether compelling and rousing coming of age tale, I’m not sure I would call it an altogether brave effort. Princess Merida (voiced by Kelly McDonald, who replaced Reese Witherspoon when she couldn’t do it, thank God) has always been more interested in playing with swords instead of playing with boys. Her father, King Fergus (Billy Connolly), encourages her while her mother, Queen Elinor (Emma Thompson), strives every day to make her into a proper princess. In order to maintain the order of the land, Merida must marry one of the first born princes from the neighboring kingdoms, but Merida is adamant about not wanting to be any part of this. 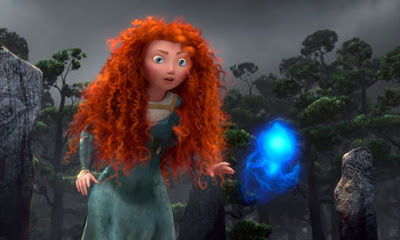 In fact, this is what Merida is best at, knowing what she doesn’t want as opposed to knowing what she does. This is why, when she pays a mysterious (and hilarious) witch to change her fate, she isn’t the least bit specific about how exactly she would like it to be changed. And so it is altered, but the question becomes, is this new path any better than the old one she was on or is it actually worse? And worse still, can Merida even make it back to her true path now that she’s embarked on this one? BRAVE is efficiently told without a trace of fat to be found. And while there are no unnecessary distractions as a result, the whole thing feels a tad rushed and bit slight considering the pedigree putting it out there. That said, Pixar’s best efforts (especially for a film that changed directing hands, and subsequently changed direction drastically, half way through) do elevate BRAVE far past its minor shortcomings to be extremely enjoyable and exciting. Merida should stand strong and proud in the long line of great Pixar characters. She shows us and herself that our fates are living and breathing inside of us at all times; we need only be brave enough to see them and embrace them. Be sure not to miss Black Sheep's interview with BRAVE director, Mark Andrews. Subscribe to Black Sheep Reviews! ABOUT THE SITE ... In September of 2005, Joseph Belanger, sat down to write what would become the first Black Sheep review. Between then and now, BLACK SHEEP REVIEWS, has been finding its voice amidst a sea of sheep. Seeing what the herd wants is fine from time to time but sometimes this sheep needs a quiet empty theatre where he can be alone and more himself. Reviewing is just his way of playing shepherd for a change ... ABOUT THE SHEEP HIMSELF ... JOSEPH BELANGER (Writer and Founder of BLACK SHEEP REVIEWS) ... I have filled out so many online "About Me" sections now and they are always a large attempt at sounding witty and important. How about an "About Me, the Film Reviewer" instead this time. Seems fitting ... Some call me a film snob ... ok, my brother calls me a film snob. I don't see myself so. I just like films to be well-intentioned, to be about something, to not talk down to me. I have a sensitive soul and I like to write about the quiet conversations that my soul has with the movies on the screen. Paris in Motion 1 - Paris in Motion 1 from Mayeul Akpovi on Vimeo. The Grapevine | Scrooging filmjuice all over your daily thoughts. LWLies 62: The Carol Issue - Pick up our latest issue and fall in love with Todd Haynes' breathtaking period romance.